The commission voted 3-2 to scrap the Obama-era rules that aimed to keep the internet open and fair. 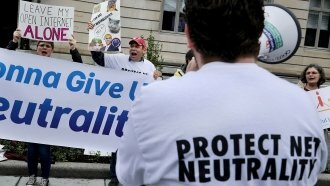 The Federal Communications Commission voted in favor of a controversial plan to repeal key net neutrality protections. The commission voted 3-2 to scrap the Obama-era rules, which were put in place in 2015 with the aim of keeping the internet open and fair. But before the members were able to cast their votes, the chamber was evacuated due to security concerns. After a brief search of the room, everyone was let back in, and the meeting continued. As Newsy previously reported, net neutrality protections basically force internet service providers, or ISPs, to treat all web content fairly and equally. It bars providers from prioritizing some content over others and from blocking web traffic. Getting rid of those net neutrality rules will remove strict government oversight and simply require internet providers to inform the public about their practices. But critics say the plan would give ISPs control over what their consumers can and can't see. Even though the vote is wrapped up, the battle for net neutrality may not be over. The issue could eventually end up in court.